Jonathon Taylor | State of Alaska Sep 7, 2017. ANCHORAGE – Governor Bill Walker today announced that he has appointed Sheldon Fisher as Department of Revenue Commissioner. Mr. Fisher, who is currently Commissioner of the Department of Administration, will transition immediately to Department of Revenue. Deputy Commissioner Leslie Ridle will serve as Interim Commissioner of Department of Administration until the governor names a new appointment. Mr. Fisher replaces Randy Hoffbeck, who retired August 17. “Having had the privilege of working with Commissioner Fisher the last three years, I am confident that he will be an exceptional Commissioner of Revenue for the people of Alaska,” Mr. Hoffbeck said. Prior to Mr. Fisher’s December 2014 appointment as Commissioner of Administration, he worked as Chief Operating Officer at McKinley Capital Management, LLC in Anchorage. Mr. Fisher also spent 15 years in the telecommunications industry—both in the Lower 48 and in Alaska. He worked for six years at Alaska Communications, where he served as senior vice president of sales and product marketing.While at Alaska Communications, Mr. Fisher was instrumental in the expansion of the wireless business, tripling revenue to $180 million, while carefully managing costs. 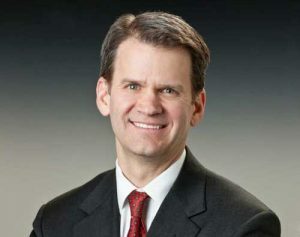 Prior to joining Alaska Communications, he was an executive at Sprint where he led the turnaround of a struggling division, preserving a $1.7 billion investment. Mr. Fisher earned an economics degree from Brigham Young University and a law degree from Yale University. He is proficient in Spanish. Mr. Fisher and his wife Christine have seven children.